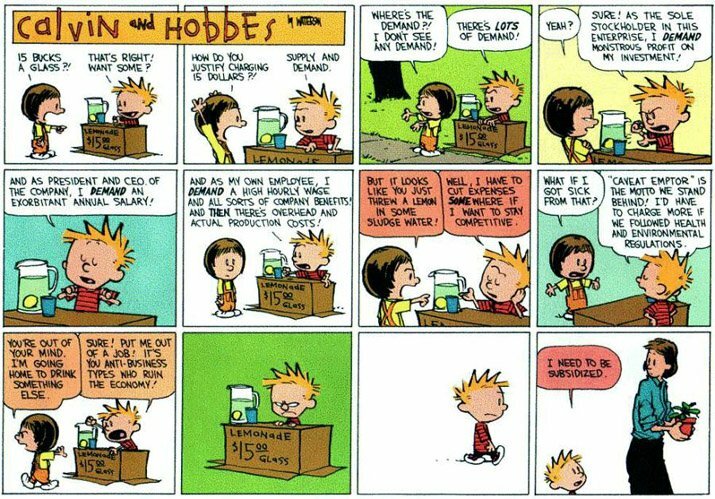 Calvin was, of course, an amazingly ahead-of-his-time capitalist. Who knew back in the 90’s that this form of capitalism would effectively crowd out every other? Now I think we’ve heard from all of the great savants of our time: Fran Lebowitz, George Carlin, Oscar Wilde and the famous and prolific Anonymous, and Calvin. This entry was posted in capitalism, comics, economics, government, news, Occupy Everywhere, Occupy Together, Occupy Vancouver, Occupy Wall Street, OccupyEverywhere, OccupyTogether, OccupyVancouver, philosophy, Politics. Bookmark the permalink. Pingback: Afternoon Links: Is Frances Bean Cobain Engaged?